Very subtle, this DA auto, Few can find the covert release. It is the faint diamond inset on the bolster carvings that were done by master engraver Amayak Stepanyan. They remind me of a stylized New York skyline with the buildings all curved and a stippled sky behind. The engraved carvings on the two bolsters have a field of stippling in the background. Nice touch. 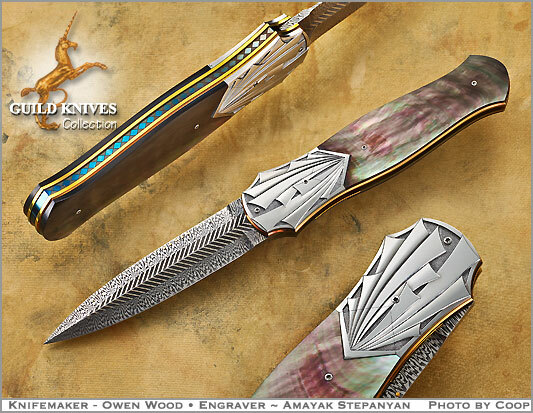 Multi bar Damascus blade in chevron pattern by maker. Note the backspine black diamond work running the full length of the handle. Very reflective Black Lip MOP scales.